In this picture, as we know power due to heating of the resistance is $V^2/R$ . Now, if we add a parallel resistance to the circuit, the power dissipated through this resistor is also $V^2/R$ because the voltage applied at the end of each resistor is the same. So, if we proceed further, the total power dissipation becomes very large if a large number of parallel resistance is added, which violates the power rating of the source. How can we explain this? Considering the comments/chats you have with @Aaron_Stevens I interpret your question as to what limits the current of a voltage source, or what limits the voltage of a current source. There are no real voltage or current sources. These concepts are idealizations (models) of real electromagnetic energy supplies that are easy to apply mathematically when the laws of Kirchhoff are applied. A real battery, for example, is neither an ideal voltage nor an ideal current source. It is a monster electrical, chemical, thermal, mechanical, etc., system for which we ignore almost everything and assume that while we are using it the voltage at its outside accessible terminals and the current through them can be modeled if it was as an ideal voltage source in series with an ideal linear resistor. In the usual model, this ideal voltage source has a voltage drop between its internal terminals (these are inaccessible to us for it is inside the battery) is a known value and it is independent of any thing we do when we connect the outside (accessible) terminals to our circuit. We also usually assume that this internal voltage drop is known at any instant of time and usually taken as a constant, but that is not very important. The only thing you are not allowed to do with an ideal voltage source is to connect its terminals with a zero resistance wire, otherwise everything is allowed and it then can supply arbitrary amount of currents. 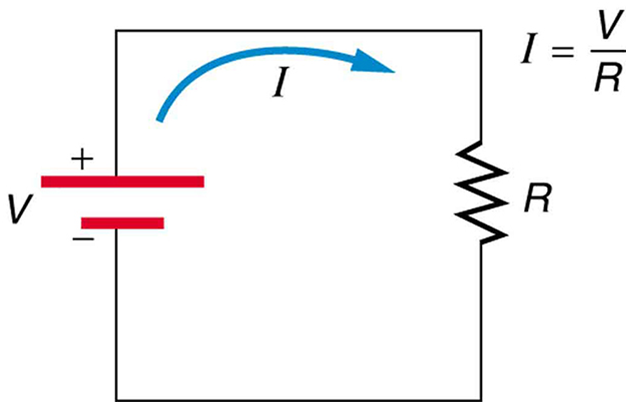 To prevent inadmissible connections and getting into contradictions with Kirchhoff's laws, e.g., infinite current, we must have some positive resistance attached to it and the real internal resistance of a real battery will do just fine for this purpose. In fact, the maximum current through the model will be then the ratio of the open circuit voltage drop and the internal resistance. Anything else you hang on it will produce lower current. A 1Ah battery, say, will deliver into the circuit to which it is connected over an hour 3600Cb, an enormous amount of charge if it was freely available. These charges are not stored statically in the battery but instead are produced continuously by the internal electro-chemical process. When we are using Kirchhoff's laws to calculate what is going on within the circuit connected to the battery we completely ignore all that electro-chemistry and just assume that the voltage is constant as long as the current draw does not exceed some limit. Your issue makes complete sense. You can look at it from multiple perspectives, although they are all related. Essentially by adding more resistors in parallel you are trying to get more from the power source. This is a great example as to why you don't want to plug so many things into outlets, since you are essentially adding more and more "resistors" in parallel with the power supply. Not the answer you're looking for? Browse other questions tagged electric-circuits electric-current electrical-resistance power batteries or ask your own question. What series resistance is needed in the circuit? Why is it that sometimes current is not inversely proportional to resistance?